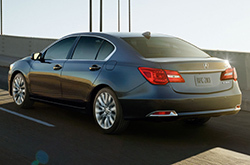 A powerful four-door sedan, the Acura RLX has garnered many rave reviews for its agile driving feel, powerful engine and luxurious interior design. This model year, the 2016 RLX is maintaining this popular design formula, but adding a few high-tech features and luxury amenities that are sure to continue to impress those looking for their next new luxury sedan near Dallas. For 2016, the base RLX and RLX with Krell Audio trims have both been dropped. Shoppers looking for the 2016 Acura RLX in Arlington will find many new features on the sedan, including the AcuraWatch safety system, which is now standard on the Technology and Advance trims, as well as a Silver Metallic exterior color that is brand-new for this model year. Looking at the rest of the sedan's features, the RLX with Navigation starts things off with a host of fantastic features. Our 2016 Acura RLX review especially loves this trim, thanks to its rearview camera, tilt-and-telescoping steering wheel, turn-by-turn navigation, leather upholstery, heated driver and passenger seats, three-zone climate control, ten-speaker sound system and satellite radio. The Technology package adds LED headlights, a six-speed Sequential SportShift with paddle shifters, a 14-speaker ELS Studio 32 Premium Audio System, automatic braking, blind-spot monitoring and a road-departure alert system. The top-tier Advance package gets the most luxury and technology features, including an all-new surround-view camera system, the very popular Krell Premium Audio system, power rear sunshades, a heated steering wheel, front and rear parking sensors and a remote engine starter. Under the hood, all three trims are powered by a 3.5-liter V-6 engine that produces 310 horsepower and 272 lb.-ft. of torque. Our 2016 Acura RLX review found that these terrific numbers were due in large part to the engine's i-VTEC, Variable Cylinder Management and Direct Gas Injection systems that help increase the RLX's horsepower and improve its fuel economy. The 2016 Acura RLX is now in Arlington. Stop by Vandergriff Acura today and take this amazing luxury sedan for a test drive! Thank you for reading vandergriff Acura's 2016 RLX review! Good reviews are hard to find ; but as the well-known Acura dealer in Arlington we've put it all in one location for you. Everything you need to know about the RLX and other Acuras is right on our site. Each summary is overloaded with vehicle specs and accessible material pulled directly from Acura and other sources you can trust to give you reliable info. Not sure if the RLX? is fit for you? Check out our online research gallery to read more Acura reviews and to compare vandergriff Acura's models to vehicles from other brands.